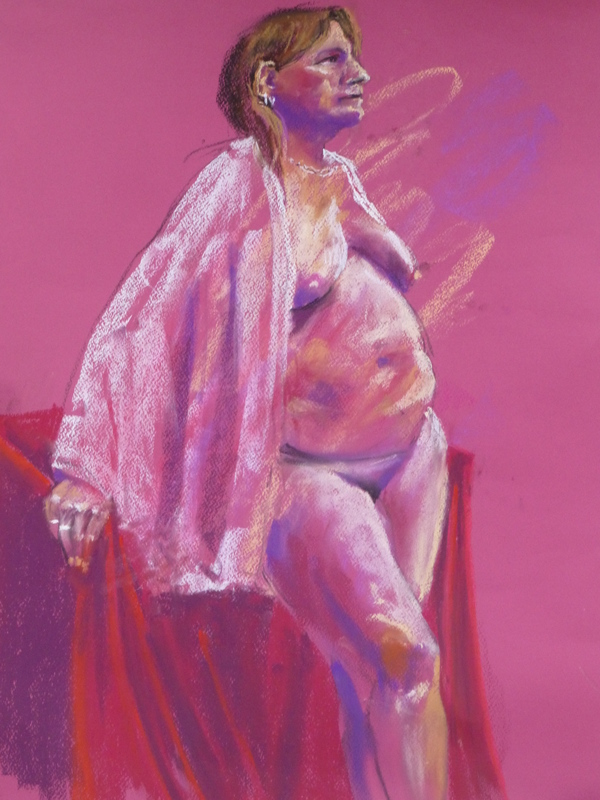 I went back to an old life drawing group and because you never know what time you have for a pose I took my pastels because I can get something quickly down with colour. 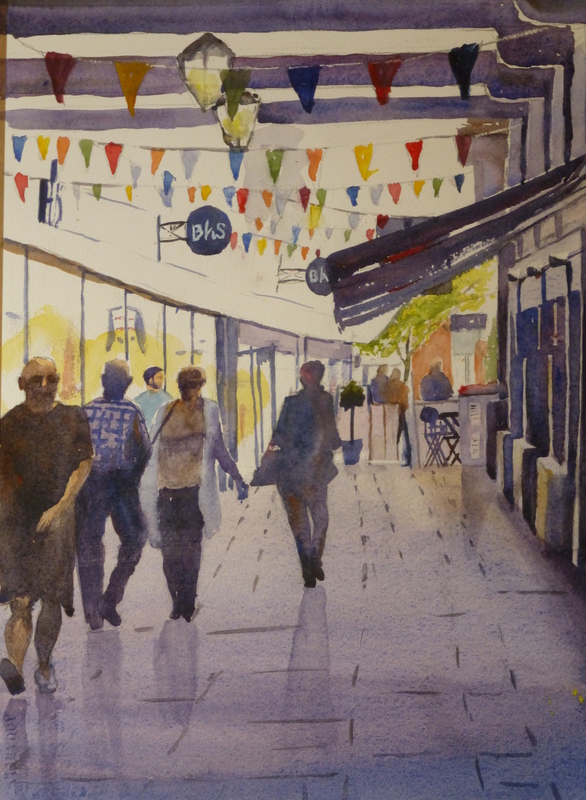 Fortunately the group decided to have a two hour pose, so I was able to work on a decent size and this means you can get some small details down which can give the painting a bit more punch. The model was up on a plinth and I took a low position to exaggerate the foreshortening. I was quite happy with the outcome, although it was a shame I didn’t get her feet in, despite measuring out the painting before I started. Maybe next time. 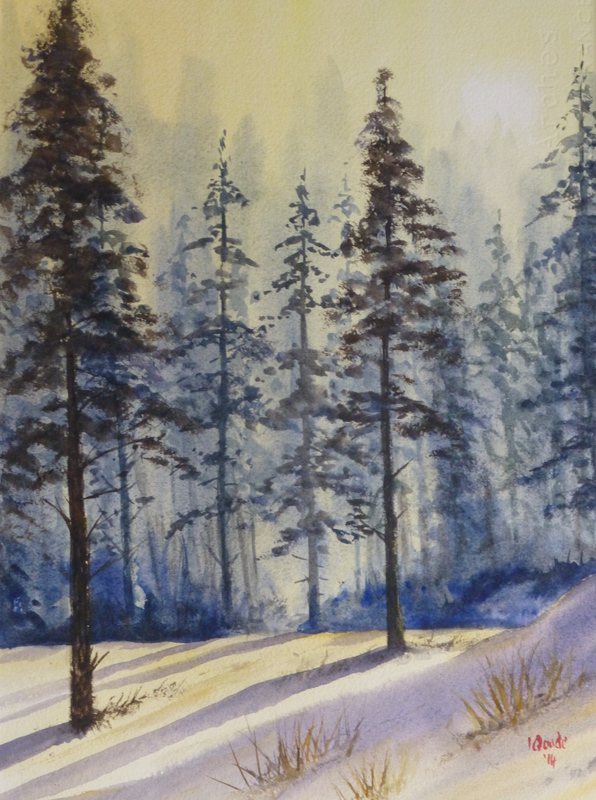 I saw an image of pine trees in the winter, after a snowfall,l and I was taken by the soft cool colours denoting the background trees. 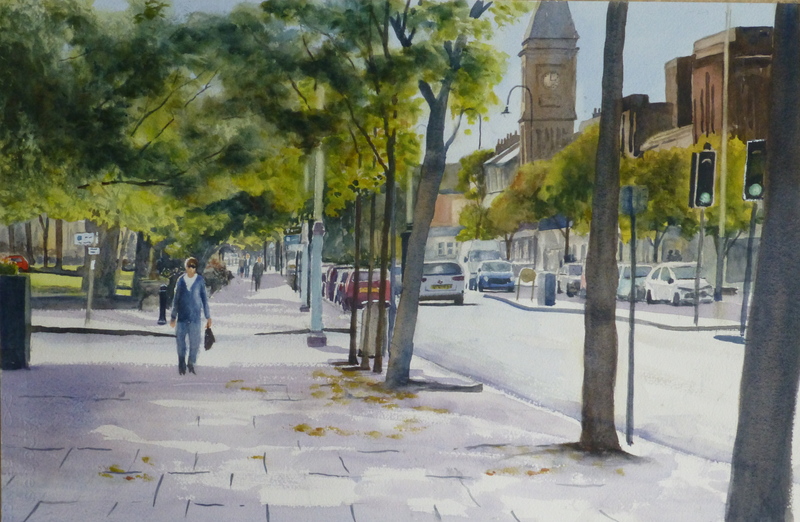 I decided to have a go, but when I completed it the trees were not native to the UK and I was not happy with the foreground trees, they lacked some authenticity. I had another go, this time making the pines our local variety and felt happier with the result. As there are a lot of pine trees behind the sand dunes on the nearby beaches, I decided to ground it in our local area with the title. I have done a number of forest scenes with mixed success, some sell others don’t. I think the darkness of the subject puts people off. Still I’m happy with the outcome and might do a few more. On my wanderings around town I was taken by the contra-jour effect of figures walking in the arcade. The cafe blinds added further darkness making the lighter area brighter and the soft shadows cast by the people seem to imply a wetness. 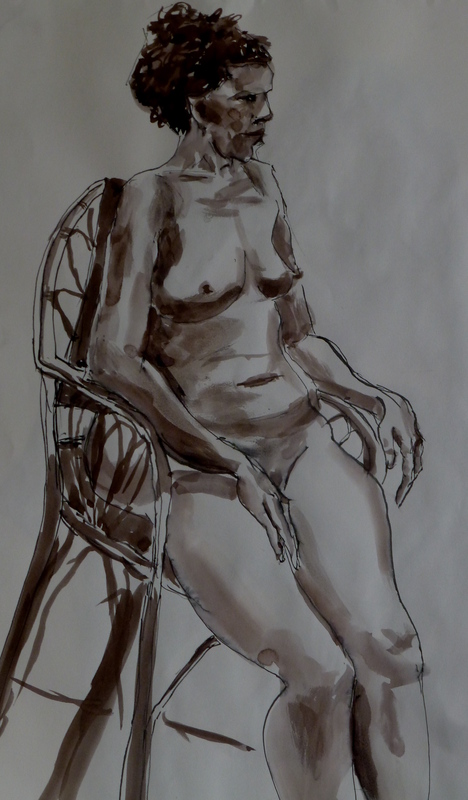 I have been trying some pen and wash work at the life drawing sessions I attend with mixed results.Here are two. 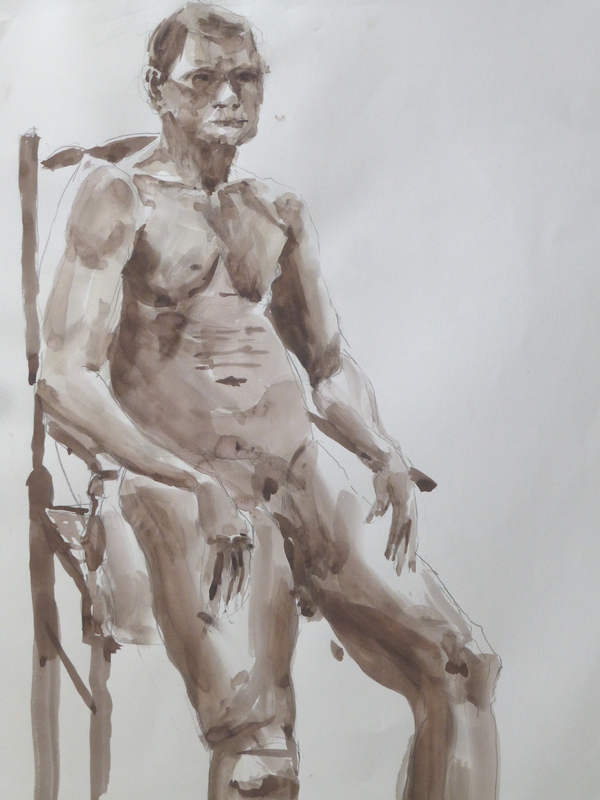 The male was done in pencil, then with an ink wash. I am disappointed with this. The clear lines on the female done with the pen gives some clear demarcation which I prefer. I will be trying some more. Each one was completed in 25 minutes.